Apartheid was a political and social system in South Africa while it was under white-minority rule. It is discrimination which is mainly based on skin color. This was used in the 20th century, from 1948 to the early 1990s. The word apartheid means "apartness" in Afrikaans. Racial segregation had been used for centuries but when the new policy started in 1948 it was strict and more systematic. In the system, the people of South Africa were divided by their race and the races were forced to live apart from each other. There were laws that kept the racial separation. The system of apartheid in South Africa was banned in 1994, when a new constitution was ratified which abolished the previous system of segregation. The last president under apartheid was Frederik Willem de Klerk, who was responsible for making the negotiations that ended apartheid. After this, Nelson Mandela became the first black president. They both were awarded the Nobel Peace Prize for their efforts. Today, the term apartheid is sometimes used for similar systems in other countries. 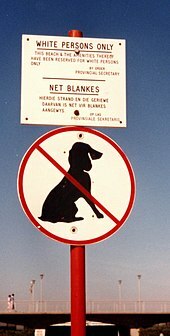 Sign from South Africa during apartheid. This sign meant that only white people were allowed in this specific area. During the apartheid, people were divided into four racial groups and kept apart by law. The system was used to deny many rights of the non-white people, mainly black people who lived in South Africa in the beginning of the apartheid times. The law allowed the white people to be in certain areas. Black people had to carry special passes or have permission to live and work in particular areas. The government separated mixed communities and forcibly moved many people. Many laws were made, for example: people of different races were not allowed to marry each other; black people could not own land in white areas or vote. The United Nations did not agree with the South African government's apartheid policies. There were protests in South Africa, like in Sharpeville in 1960 and in Soweto in 1976. After the Sharpeville Massacre, the UN tried to remove South Africa in 1974. France, the United States, and Britain stopped that from happening. The Soweto Uprisings started because Africans were forced to study some subjects at school in Afrikaans. Many black people did not like Afrikaans because it was the language of the apartheid government and the language of their oppressors. In 1989 F. W. de Klerk became the President of South Africa. He wanted to put a end to apartheid. In a speech in 1990, de Klerk said the African National Congress was legal again. He also ruled that Nelson Mandela would be released from prison. In 1991, the UN created the National Peace Accord. The purpose of the Peace Accord was "to bring an end to political violence" in South Africa. It was agreed on by 27 organizations and governments. After this the Convention for a Democratic South Africa (CODESA) was formed. CODESA worked to find a solution to the violence. The first democratic election was on 27 April 1994. Nelson Mandela became president, with De Klerk and Thabo Mbeki as deputies. This is considered the end of apartheid rule. Sign at a beach: This beach has been reserved for white people only. The aim of apartheid was to separate the people of South Africa into small independent nations. The black ones were called Bantustans. South Africa said they were independent countries and exchanged ambassadors but other countries did not. The National Party government did not want to spend a lot of money on this project. They also wanted to keep the majority of South Africa's land for white people, especially the richest places, like the gold mines of Johannesburg. They wanted black men to work in these mines for little money but their families had to live far away or face imprisonment. ↑ "Apartheid (1948-1994)". Retrieved October 4, 2017. ↑ "Constitution of South Africa" (in en). Wikipedia. 2018-12-23. https://en.wikipedia.org/w/index.php?title=Constitution_of_South_Africa&oldid=875052601. ↑ "United Nations - Office of Legal Affairs". legal.un.org. ↑ "National Peace Accord" (PDF). United Nations. Retrieved 4 October 2017. ↑ 12.0 12.1 Cohen, Mike (October 30, 2012). "South Africa's Racial Income Inequality Persists, Census Shows". Bloomberg. Retrieved May 22, 2016. This page was last changed on 21 April 2019, at 09:08.